Summary: Do you ever find yourself out and about and suddenly starving? Here are the best places you can stop and find some healthy snacks. Do you ever find yourself out and about and suddenly starving? Or you packed your food for work, ate it ALL and are still hungry? This definitely happens to me, and it’s great to know the best places you can stop and find some healthy snacks. Although some of these locations are only in certain cities, hopefully there are some great options here that work for you! Starbucks. This is my go-to, especially in Chicago where there’s a Starbucks on every city block. They always have fresh food, bananas and so many snacks. And if you need a meal they have great options for that as well, especially their egg white spinach feta wrap! Protein Bar: This is one that is only in a few cities, but if you see one, definitely try it out! If you just need a snack they have healthy snack bars, hard boiled eggs, fruit and yogurt, depending on the location. Plus you can get vegetable juice or a smoothie! Subway: I usually am not a fast food fan, but if you have to, Subway is a good option because you can get a salad, some healthy snacks out of their fridge section, or a half of a turkey or veggie sandwich. Perfect for when you’re out on the road and need something quick! CVS/Walgreens: We also have quite a few of these in the city, and they’re a great source for a quick healthy snack. AVOID the candy and go for a small bag of nuts or trail mix. You might consider buying a box of healthy snack bars so that you have a few extras to keep in your purse or your desk. 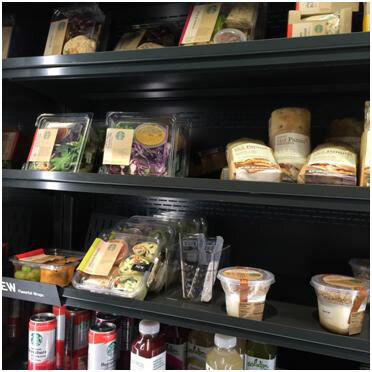 They also often have yogurt, string cheese, fruit and some have pre-made salads and other food options. Local Markets: When I was traveling in Europe and I was hungry, I always avoided the touristy areas and just headed into a local grocery store. It was so much easier to grab an apple, some nuts, or anything else, plus a bottle of water. It also usually ended up costing around 50 cents rather than 6 euro. This works for any city.Just try searching Google Maps for a grocery store nearby, or ask someone where the closest market is!